Putting the bitterness of the primary election campaign behind them, Antonio Villaraigosa and Lt. Gov. Gavin Newsom held their first joint appearance Tuesday, with the former Los Angeles mayor vowing full support for his fellow Democrat’s gubernatorial bid. Villaraigosa, who finished third in the June 5 primary and will watch from the sidelines as Newsom takes on Republican businessman John Cox, a Rancho Santa Fe resident, in the November general election, said he will work to get out the vote for the lieutenant governor. “I think it’s important that we work together, because a vote for John Cox is a vote for Donald Trump,” Villaraigosa said outside Homegirl Cafe north of downtown Los Angeles, where he had his first public appearance with Newsom since the primary election. Villaraigosa endorsed Newsom that night. “Donald Trump endorsed (Cox’s) candidacy, and he did because they both agree that we should have a wall instead of a bridge,” Villaraigosa said. 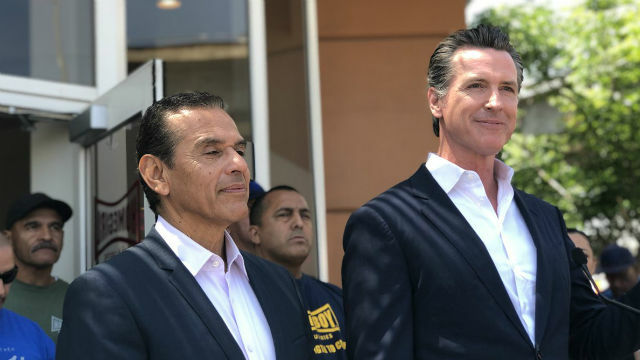 At their joint appearance, Villaraigosa and Newsom downplayed the primary election swipes. “Both of us love this state. We grew up here. We want the best for our state,” he said. Newsom said he welcomes Villaraigosa’s commitment to his campaign, a commitment that he said will unify Democrats in opposition to Cox. “I expect and will request all the support and counsel, advice, direction and advocacy to work in a coordinated fashion to turn out that vote this November,” Newsom said. A USC Dornsife/Los Angeles Times poll released Tuesday found Newsom had the support of 45 percent of registered voters, while Cox had 28 percent, and 27 percent of voters were undecided.